The festivities on Koningsdag are often organised by Orange committees (Oranjecomité), local associations that seek sponsorship and donations for their activities. In recent years some committees have had difficulty in recruiting new members from among the younger Dutch. The vrijmarkt (literally “free market”) is a nationwide flea market, at which many people sell their used goods. Koningsdag is the one day of the year that the Dutch government permits sales on the street without a permit and without the payment of value added tax. ING Bank found in 2011 that one in five Dutch residents planned to sell at the vrijmarkt and estimated they would earn $100 per person for a total turnover of $290 million. Over half of the Dutch people buy at the vrijmarkt. ING Bank predicted they would spend over $28 each at the 2011 vrijmarkt. The Queen has been known to buy at the vrijmarkt, in 1995 she purchased a floor lamp. The bank also forecast that the lowest level of sales at the vrijmarkt in 2011 would be in the province of Limburg, site of the Queen’s visit. Among the most popular areas for the vrijmarkt in Amsterdam is the Jordaan quarter, but the wide Apollolaan in front of the Hilton hotel in Southern Amsterdam is gaining in popularity. Children sell their cast-off toys or garments at the Vondelpark, also in Southern Amsterdam, and in a spirit of fun passers-by often offer the young sellers more than they are asking for the goods. Untill `996 the vrijmarkt began the evening before and discontinued for 24 hours. This was ended in the hope of gaining a pause in the celebrations so preparations could be made for the daytime activities. Utrecht, uniquely among Dutch municipalities, retains the overnight vrijmarkt. Koningsdag now sees large-scale celebrations, with many concerts and special events in public spaces, particularly in Amsterdam. 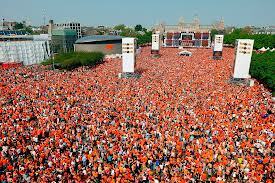 An outdoor concert is held on Amsterdam’s Museumplein, where as many as 800.000 people may gather. To aid visitors in returning home by train after the festivities outdoor events must end by 20,00, and the Museumplein show by 21.00. The city center is closed to cars, and no trams ride in the heart of the city; people are urged to avoid Amsterdam Centraal railway station and use other stations if possible from their direction. International trains that normally begin or terminate at Amsterdam Cenraal are instead directed to a suburban stop. 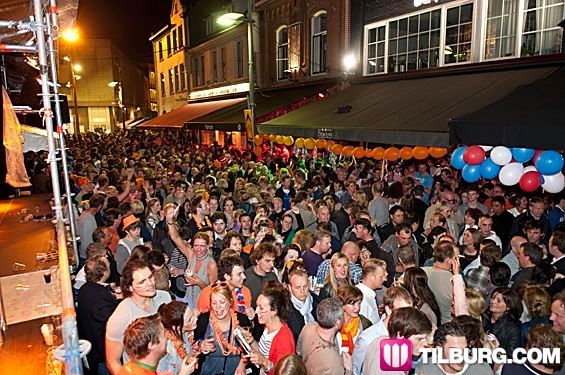 In recent years parties and concerts have been held the evening before Koningsdag. Until 2013, nightclubs across the Netherlands organised special events for what became known as Koninginnenacht (Queen’s night). Many young people celebrate in the streets and squares (and in Amsterdam, the canals as well) throughout the night, and after all-night partying join the crowds at the vrijmarkt. While King’s day celebrations take place throughout the Netherlands, Amsterdam is a popular destination for many revelers. Often the city’s 750.000 residents are joined by up to 1 million visitors. In recent years Amsterdam authorities have taken some measures to try and stem the flow of visitors as the city simply became too full. Friendships and community will be formed. For me that’s really what Queen’s Day is all about. It’s not an outburst of patriotism, it’s not even about the popularity of the royal family. It’s about a sense of belong. For one day, everybody is the same in Holland. Bright orange and barmy. Koningsdag or King’s Day is a national holiday in the Kingdom of the Netherlands. Celebrated on 27 April (the 26th if the 27th falls on a Sunday), the date marks the birth of King Willem-Alexander. From 1890 to 2013, the day was known as Koninginnedag or Queen’s Day. The holiday was first observed on 31 August 1885 as Prinsessedag or Princess’s Day, the fifth birthday anniversary of Princess Wilhelmina, heiress to the Dutch throne. On her accession, the holiday acquired the name, Koninginnedag. When held on 31 August the holiday was the final day of school summer vacation, leading to its popularity among children. Following the accession of Wilhelmina’s daughter Juliana in 1948, the holiday was moved to Queen Juliana’s birthday on 30 April. Her daughter, Beatrix retained the celebration on 30 April after she ascended the throne in 1980, despite her actual birthday occuring on 31 January. Beatrix altered her mother’s custom of receiving a floral parade near a Royal palace, instead choosing to visit different Dutch towns each year and join in on the festivities along with her sons. In 2009, the Queen was carrying out this custom in the City of Apeldoorn when Karst Tates attempted to attack her by trying to ram the Royal family’s vehicle with his car; instead he drove into a crowd of people who were watching the parade and fatally crashed into the monument. Seven people in the crowd were killed, and the car’s driver also died soon afterwards. 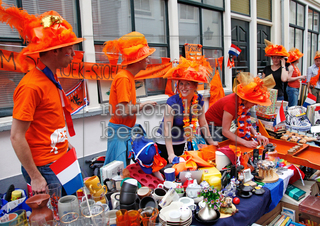 Koningsdag is known for its nationwide vrijmarkt (free market), at which many Dutch sell their second-hand items. It is also an oppourtinity for “orange madness” or oranjegekte for the national colour, when the normally strait-laced Dutch let down their hair, often dyed orange for the occasion. Faced with an unpopular monarchy, in the 1880s the liberals in the Dutch government sought a means of promoting national unity. King William III was disliked, but his four-year-old daughter Princess Wilhelmina was not. A holiday honouring King William had been intermittently held on his birthday, and J.W.R. Gerlach, editor of the newspaper Utrechts Provinciaal en Stedelijk Dagblad, proposed that the princess’s birthday be observed as an opportunity for patriotic celebration and national reconcilation. Prinsessedag or Princess’s Day was first celebrated in the Netherlands on 31 August 1885, Wilhelmina’s fifth birthday. The young princess was paraded through the streets, waving to the crowds. The first observance occurred only in Utrecht, but other municipalities quickly began to observe it, organizing activities for children. Further processions were held in the following years, and when Wilhelmina inherited the throne in 1890, Prinsessedag was renamed Koninginnedag, or Queen’s Day. By then almost every Dutch town and city was marking the holiday. Another summertime birthday celebration in the Netherlands was that of Wilhelmina’s mother, Queen-Regent Emma, who after Wilhelmina attained adulthood generally spent her own birthday, 2 Agustus, at Soestdijk Palace in Baarn. Untill her death in 1934, Emma received an annual floral tribute from the townsfolk on her birthday. In 1937 Wilhelmina’s daughter and heiress, Princess Juliana, took up residence at Soestdijk Palace following her marriage and the townsfolk made their floral presentation to her, moving the date to Juliana’s birthday, 30 April. In September 1948 Juliana ascended to the Dutch throne and from 1949 onwards Koninginnedag was on her birthday. The change in date attracted immediate approval from Dutch children, who gained an extra day of holiday. The first observance of the holiday on the new date included a huge circus at the Amsterdam Olympic Stadium – one not attended by the royal family, who remained at Soestdijk Palace. Queen Juliana retained the floral tribute, staying each year on Koninginnedag at Soestdijk Palace to receive it. The parade became televised in the 1950s, and Koninginnedag increaslingly became a national holiday, with workers given the day off. Juliana had a reputation as a “queen of the people”, and according to Peek “it felt as if she invited her subjects to the royal home”. When Queen Beatrix succeeded her mother Juliana on the latter’s abdication on 30 April 1980, the new queen decided to keep the holiday on 30 April as a tribute to her mother. The reason was practical as well – Beatrix’s actual birthday on 31 January is less conducive to the traditional outdoor activities. The birthday of the Queen’s son and heir, Willem-Alexanders, Prince of Orange is a 27 April. 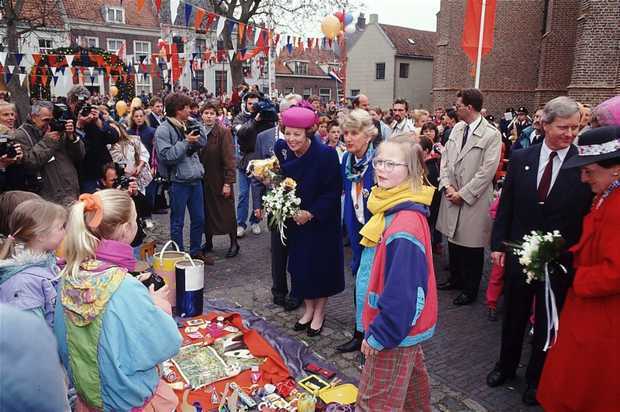 Rather than remaining at the palace and letting the Dutch people come to her, Beatrix instead usually visits two towns each year for Koninginnedag celebrations. Local crafts and customs are demonstrated for the royal family, who have the opportunity to join in. Koninginnedag celebrations have sometimes been affected or disrupted. In 1988 three British servicemen stationed in Germany who were in the Netherlands for Koninginnedag were killed in Irish Republican Army attacks. In 1996 the celebrations in Rotterdam were dampened by an alcohol ban, put in place following riots earlier in the week after local football club Feyenoord won the Dutch League Championship. The Queen’s scheduled 2001 visits to Hoogeveen and Meppel were postponed for one year owning to an outbreak of foot-and-mouth-disease. On 28 January 2013 Queen Beatrix announced her abdication on 30 April 2013 in favour of her son, Willem Alexander. On 30 April 2013, on Queen’s Day, Prince Willem-Alexander succeeded his mother Beatrix and Became King of the Netherlands. Consequently, from 2014 onwards the name is to be changed from Queen’s Day into King’s Day. Also the date would change from 30 April to 27 April, which is the birthday of Willem-Alexander. On the first King’s Day, which is scheduled for 26 April 2014 because 27 April is a Sunday, the king is scheduled to visit Amstelveen and De Rijp. Jenever (also known as geniévre, genever, peket or Dutch gin), is the juniper-flavored national and traditional liquor of the Netherlands and in Belgium, from which gin evolved. To this day traditional jenever is very popular in these areas. European Union regulations state thatonly liquor made in the Netherlands, Belgium, two French provinces and two German federal states can use the name jenever/genever/geniévre. And only jenever made in East-Flanders, Belgium can use the name O’de Flander-Oost Vlaamse graanjenever. Jenever was originally produced by distilling malt wine (Dutch translation moutwijn) to 50% ABV. The resultation spirit was not palatable due to the lack of refined distilling techniques (only the pot was still available), therefore herbs were added to mask the flavour. The juniper berry (Dutch translation jeneverbes), was chosen for its alleged medicinal effects, hence the name jenever (English translation gin). It was first sold as a medicine in the late 16h century. While many believe that Dutch chemist & alchimist Sylvius de Bouve, the problem with this theory is that Dr. Sylvius was born in the 17th century and that during his fourteen-year tenure as a professor at the University of Leyden, his research included distilling medicines with juniper berry oil, but none of his research papers contain any reference to genever. Additionally, in 1606 the Dutch had already levied taxes on genever and similar liquors which were sold as alcoholic drinks, suggesting that genever had stopped being seen as a medicinal remedy many years before Dr. Sylvius was even born. There remains no definitive proof from either Belgium or the Netherlands as to who invented genever but we can unambigously claim that the early history of genever lies in Flanders, Belgium. There are two types of jenever: old jenever and young jenever. This is not a matter of aging, but of distilling techniques. Around 1900, it became possible to distill a high-trade type of alcohol almost neutral in taste, independent of the origin of the spirit. A worldwide tendency for a lighter and less dominant taste, as well as lower prices, led to the development of blended whisky in Great Britain, and in the Netherlands to Jonge (young) Jenever. During the Great War, lack of imported cereals and hence malt, forced the promotion of this blend. Alcohol derived from molasses from the sugar beet industry was used as an alternative to grain spirit. People started using the term oude for the old-style jenever, and jonge for the new style, which contains more grain instead of malt and can even contrain plain sugar-based alcohol. In modern times, jenever distilled from grain and malt only is labeled Graanjenever. Jonge jenever can contrain no more than 15% malt wine and 10 grams of sugar per litre. Oude jenever must contain at least 15% malt wine, but no more than 20g of sugar per litre. Korenwijn (grain wine) is a drink very similar to the 18th century style jenever, and is often matured for a few years in an oak cask; it contains from 51% to 70% malt wine and up to 20g/l of sugar. Although the name oude jenever does not necessarily mean that the jenever is, in fact, old; there are some distilleries that claim their jenever is aged in Oak barrels. Jonge jenever has a neutral taste, like vodka, with a slight aroma of juniper and malt wine. Oude jenever has a smoother, very aromatic taste with malty flavours. Oude jenever is sometimes aged in wood; it’s malty, woody and smoky flavours lend a resemblance to whisky. DIfferent grains used in the production process make cause of different flavoured jenevers. These include barley, wheat, dinkel wheat and rye. Hasselt and East-Flanders in Belgium, and Schiedam and Amsterdam in the Netherlands, are well known for their jenevers and often referred to as “jenever cities”. In Amsterdam, jenever is made by Van Wees and Wynand Fockink. Well-known Schiedam jenever distilleries include Nolet, Onder De Boompjes, Wenneker, De Kuyper, Dirkzwager and Hasekamp (who export significant quantities to Africa). Near the Dutch-Belgian border, in Baarle-Nassau, Zuidam produces traditional jenevers and Dutch liquors. Other jenever-cities in the Netherlands are Groningen and Dordrecht. In Belgium, Deinze is very well known for the Filliers distillery and Aalst is well known for Stokerij De Moor, Belgium’s smallest distillery and only Belgian distillery to export genever to the USA. Traditionally the drink is served in a tulip-shaped glass filled to the brim. Jonge jenever is served at room temperature, sometimes, though this is now quite old-fashioned, with some sugar and a tiny spoon to stir. The drink is sometimes served cold from a bottle kept in a freezer or on the rocks (with ice), but this is frowned upon by purists. The higher quality oude jenever (and korenwijn) is usually served at room temperature. When jenever is drunk with beer (normally lager) as a chaser, it is referred to as a kopstoot (headbutt) or duikboot (submarine) in Flanders. Traditionally, jenever is served in full shot glasses taken directly from the freezer. As the glass is very cold it is advisable to take the first sips without holding the glass, leaving it on the table and bending one’s back to apply one’s mouth to the glass. “Oliebollen” are a traditional fried yeast dough dish from the low lands. Traditionally there are eaten by the Dutch on New Years Eve, also they’re being sold on fun fairs all across the Netherlands and Belgium. Oliebollen are manufactured by using two spoons to drop an amount of batter in a pan with hot oil to form a sphere-shaped oliebol, you leave it in the pan untill it becomes brown. The batter consists of flour, eggs, yeast, some salt and milk, sometimes beer is used instead of yeast since beer contains yeast. The batter should rise for around an hour, making the oliebol is a very light baked good. Most of the time oliebollen get eaten with powdered sugar. There are several theories about the origin of the oliebol. This one in particular is referring to the Teutonic tribes in the area that is now known as the Netherlands. They would consume these baked goods at the “Joelfeest”, between December 26 and January 6. According to the Teutonic would he goddess Perchta and other evil spirits wander at night. To satisfy these spirits food was offered, most of them containing fried dough. Because of the fat the sword of Perchta would simply slide off the body. It is suspected that the Portuguese Jews during the Spanish Inquisition fled to the Netherlands with their recipes. In Portugal at that time, there was also something similar to the oliebol. (dried) Southern Fruits. For centuries the Dutch ate “oliekoek”, an old name for oliebol. 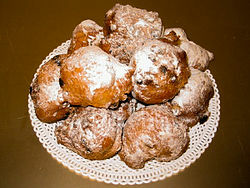 The oliebollen back then are very similar to the oliebollen now. At that time, they were baked in Lard or “Raapolie”. During the nineteenth century the word “oliebol” started to be used momre. In 1868 Van Dale, a famous Dutch dictionairy, put the word “oliebol” in its dictionary. In that dictionary they say that “oliekoek” is a more commonly used term, but then there was a major change and from the early twentieth century the word “oliekoek” was not used anymore and had been replaced by “oliebol”. A “knikker” is a little massive sphere-form of glass, marble, rock, wood, clay or synthetic material. Sometimes they’re also made of metal. Most of the time they’re used for kids for the game “knikkeren”. In the Flanders area they’re also called marbles. The sphere-form has a diameter of approximately one to five centimeter. The game of knikkeren was already known in the antiquity, also the Roman and Egyptian kids used to play with them. There are many different variations of knikkeren, with each a specific goal and rules. Knikkeren is the game you play with the marbles. There are multiple variations. 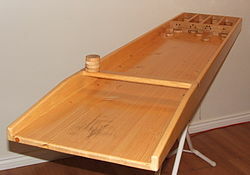 A populair variation is where multiple players take turns, each starting at a certain distance and have to throw the marbles into a pit or a “knikkerput”. The players must try to hit the marbles of the opposing players so they roll away farther away from the pit. The player who gets all the marbles first in the pit wins the game. Often, but this differs from each region or even differs from each school, there are different kinds of marbles which have a certain value. 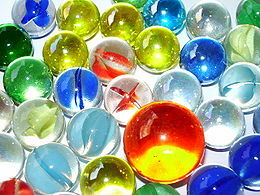 In general the larger marbles have an higher value than the smaller ones, and rare marbles with an odd colour pattern also have an higher value than the common marbles. This has consequences to the betting of the marbles, since the amount of points that can be obtained must be equal on each side. Most of the time the players play for the marbles, the winner keeps all the marbles. Kids keep there marbles in a special bag; the “knikkerzak”. My school used a different variation where each player has one marble to use and take turns. We start throwing the marble from a set distance to the pit, depending on where the marble is on the ground the players use their thumb to lob the marble into the pit. Using your index finger to hold your thumb back and release when there is enough tension on your thumb is a common technique called “pieken”. Using this technique correctly can make a player lob the marble from a far distance into the pit, the first player to get his marble into the pit takes both marbles and the game ends there. Clay marbles are being made in factories since 1870. Starting in 1890 also glass marbles could be made in factories by special marble machines. Marbles exists of all kinds of materials, but the glass marble stays the most populair and is the most durable (doesn’t wear off or break fast). It is not that easy to make glass marbles. Molten glass has to be divided in equal size cylinders. These cylinders are then going into a special machine with a kind of millstone, which rolls the warm glass into little spheres. It is very difficult to do this very precisely. The expression “Iemand eruit knikkeren” means removing someone against their will from a situation (marriage, café, etc. ), usually the reason for this is bad behaviour. Annually the National Knikker Championchips are held in Noordeloos. The “sjoelbox” is 2 meters long. The gates have (from left to right) a value of 2,3,4 and 1. The value is given by the amount of copper nails that have been placed above the gate. Between the open front-side and the middle-part has been cross-lath. DIt marks the border between the throwing zone and the middle-part, where the discs are allowed to be moved by other discs.Discs that bounce back in the throwing zone can not be played again, although this can be discussed by the players you’re playing with. Also the cross-lath can be used to place the discs on. Every gate has a different point value. The gates on the outside are 1 and 2 points, the gates in the middel are 3 and 4 points. If a player can shove a disc in each gate, the combination is not worth 10 but 20 points. So 2 discs in each gate are worth 40 points, etc.. Any leftover discs in the gate are worth the given value on the gate. With 30 discs a player can get a maximum amount of 148 points, 7 combinations of 4 discs for 20 points each + 2 discs x 4 points. If the player got all 148 points in one round, the player can get a total of 8 bonus points. The player gets a disc back for each turn not used. 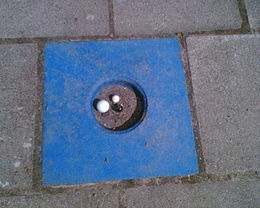 When a player throws most of the discs in the 1-point gate, the Dutch call it “Eendjes voeren” (feeding ducks).